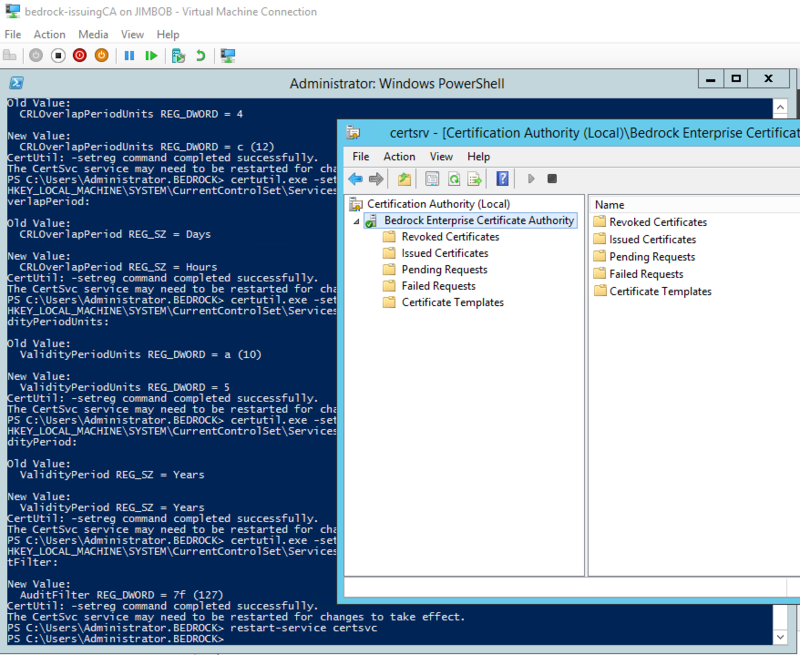 This is the fourth part of a seven-part series explaining and setting up a two-tier PKI with Windows Server 2016 in an enterprise SMB setting. In this part, we set up and configure the subordinate Enterprise CA server named issuingCA. This server must be joined to the domain, and must have a reliable network connection. 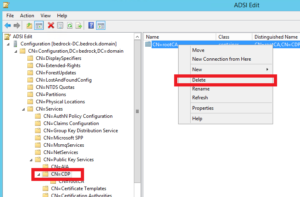 Before installing and configuring the AD CS role, there’s a few things that need to be done first. Just like with the RootCA server, we also need to do this on the issuingCA server. However, the configuration will be a little different, which I will explain below. 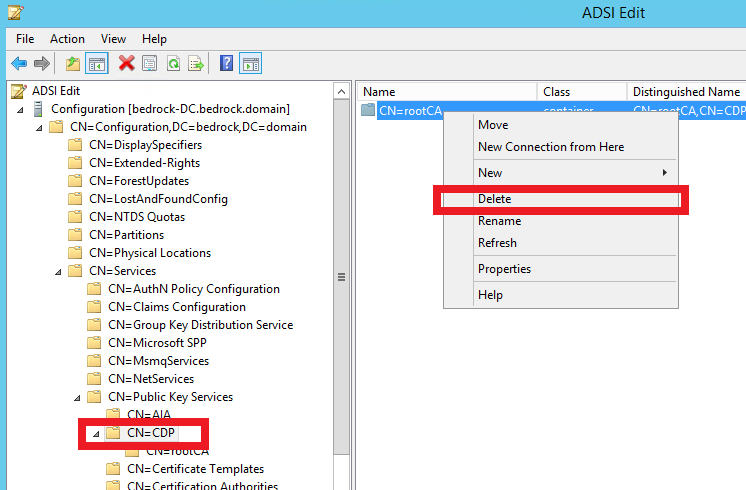 You need to again create this file in C:\Windows\CAPolicy.inf BEFORE you install the Certificate Services role. It’s important to configure the RenewalValidityPeriodUnits to a number that is high enough to meet the needs of your environment. Keep in mind that you will need to turn on the RootCA server every time you need to renew the certificate of this server (issuingCA). I configured the above parameter to 10 years, which is how long the certificate of this server will last until it must be renewed, unless for some reason it becomes compromised and needs revoked. Typically, you configure a Root CA to 20 years and tier 2 subordinate CAs 10 years, and so on. The additional parameters that we configured on the RootCA are not included in the CAPolicy.inf file on this server. You may exclude the PolicyStatementExtension and InternalPolicy sections. This next step is a good idea because it helps streamline distribution, and it will not negatively impact anything. You may also choose to publish the Root CA cert via Group Policy. This command will automatically push domain joined computers and servers to have the Root CA cert installed to their local certificate stores. Doing this via below command and via Group Policy is fine. Don’t publish the CRL to Active Directory unless you need to. I’m not doing so in this guide and not configuring the issued certificates to check LDAP for the CRL because it’s not a good idea. Not all devices will have access to LDAP. But here is the command to publish the Root CA CRL to AD. Where “RootCA” above is the name of your root ca server. Finally, you need to add the Root CA cert and CRL to the local certificate stores. certutil.exe –addstore –f root "C:\BEDROCK-ROOTBedrock Root Certificate Authority.crt"
certutil.exe –addstore –f root "C:\BEDROCK-ROOT.crl"
On the server: issuingCA, install the Active Directory Certificate Services role. Now that the Certificate Services role is installed on issuingCA as pictured above, we need a certificate for the server before we can start the Certificate Services, as showin in the yellow warning message. This means you need to submit a certificate request to the RootCA, where we’ll then approve the request on the RootCA, get the certificate, and install it on issuingCA. Then we can finally start the Certificate Service. 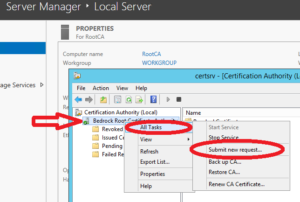 On the server: RootCA, open up the Certification Authority tool from the Tools menu in Server Manager. 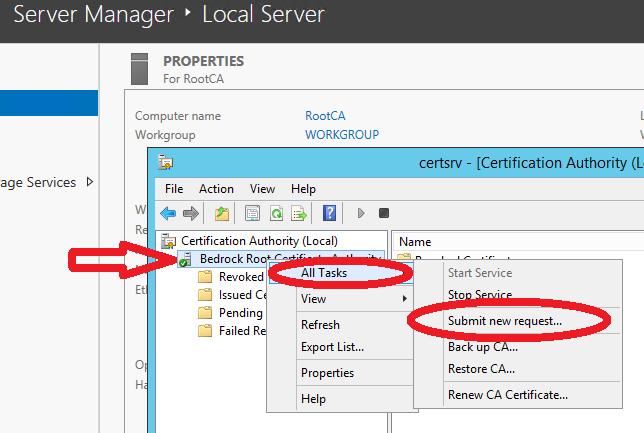 Right-click on Bedrock Root Certificate Authority, select All Tasks, and then click Submit new request. Browse to the “C:\issuingCA.bedrock.domain_Bedrock Enterprise Certificate Authority.req” file and click Open. In Certification Authority window, select Pending Requests. If you don’t see the pending certificate request, hit refresh. Right-click on the request, select All Tasks, then click Issue. Highlight Issued Certificates, and make note of the Request ID. Copy the “C:\issuingCACert.crt” file to the C drive of the server: issuingCA. Now that we have a certificate to install on the issuingCA server, which should have already been copied from the RootCA after the request was approved and the certificate issued, we need to install the certificate on issuingCA. Open the Certificate Authority tool from Server Manager. 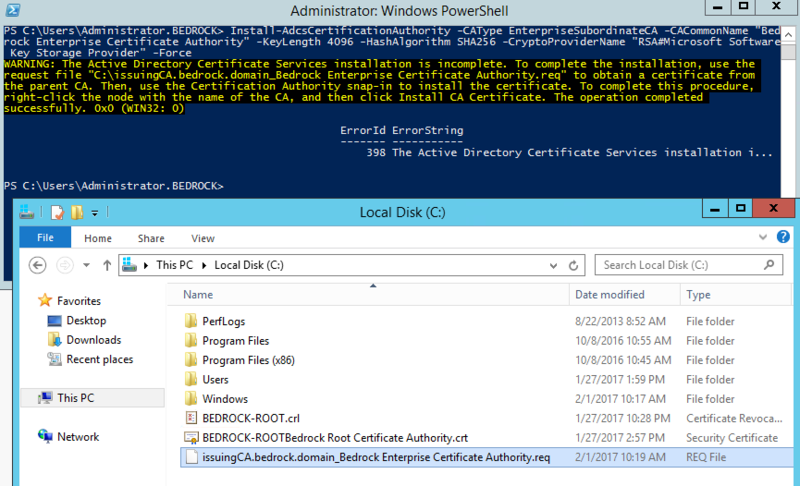 Right-click the Bedrock Enterprise Certificate Authority, select All Tasks, then click Install CA Certificate. Browse to the “C:\issuingCACert.crt” file and click Open. It may take a few seconds to process. Do NOT start the service yet. We want to perform some configurations first in the next step. The issuingCA is now ready to go, but before we start the Certificate Authority service, you should set some configuration changes. Normally at this point, you would publish the new CRLs. But because we made the configurations first before turning on the CA services for the first time, they were automatically already published to the webserver, if you changed the CDP publication locations appropriately. If you started the CA service first before you made the configuration changes, publish the new CRL and Delta CRL per below. That is not the file name issued certificates will be looking for in the AIA location, so we need to copy the file to WebServ1 and also rename the file. 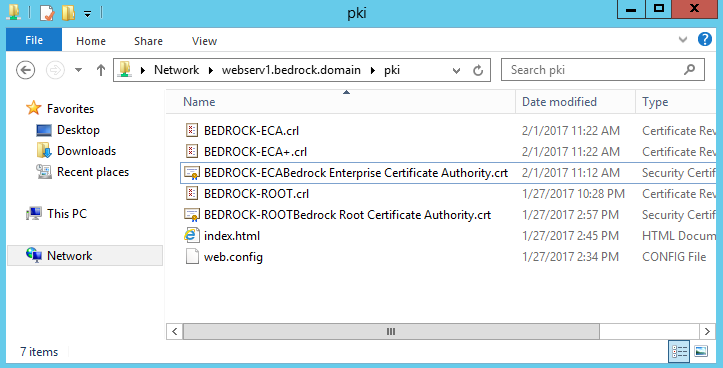 copy "C:\Windows\System32\CertSrv\CertEnroll\issuingCA.bedrock.domain_Bedrock Enterprise Certificate Authority.crt" "\\WebServ1.bedrock.domain\pki\BEDROCK-ECABedrock Enterprise Certificate Authority.crt"
If you look in your pki share on the webserver, it should now be there. On your webserver, whether it’s internal or external, you will need 5 very important files in there, all correctly named and highly-available. All issued certificates will check for these files, and if not available, the certificate will be invalid until you correct the connectivity or name issues. If the above web server is not accessible publicly, and you configured your CDP and AIA url’s to a public address, you will need to manually copy the above 5 files from your internal web server to your externally hosted web server. If you have configured your CRL and Delta CRL publication times to two weeks and 2 days respectively, you’ll find yourself having to copy the Delta CRL file to your externally hosted web server every other day. So you can either adjust that to be longer, or figure out a way to have it done automatically via scheduled task or script. Or, simply, configure public HTTP access to this web server. The CRL timing doesn’t become important until you start revoking certificates. Depending on what you use your PKI for, you may not need to frequently revoke certs… or you may need to. The Root CA and Subordinate Enterprise CA are both set up and services configured. The next step would be to install OCSP, but I’m skipping that for now and moving on to setting up Certificate Templates and AutoEnrollment for distributing certificates to users and devices. First with configuring key archival. I’ll also show how to set up a template for SSL certs, and a template for providing the ability to distribute certificates to external users. I define external users as those who are not on your domain. They may be a vendor you may need to communicate with using encrypted emails or another party. Amazing write up and it’s exactly what I needed to get started for our domains setup. Quick question, I don’t have a delta crl listed at all. Was there something I might’ve missed? I face to some troubles during the step 9 of “Submit Certificate Request to RootCA”. The .req file is correctly created and treated by my RootCA but no .crt file is created. The console shows an issued certificate corresponding to the .req file but i can’t find the .crt file. Do you have an idea to solve this issue. First thing, thanks for all this step-by-step for 2 tier pki, it’s reaaly awesome. I’m encounter problem when i’m trying to issu the SubCA, I get this error 0x800b0113 and retruning me a different OID than what I put in my CAPolicy on the SubCA. for be clear when I create the Root CA, I put this OID : 1.3.6.1.4.1.xxxxx.1.1. In the CA Policy in the SubCA I tryied this 1.3.6.1.4.1.xxxxx.1.1 and 1.3.6.1.4.1.xxxxx.1.2 and alwayd get the same error (Error when creating ou publishing certificat. invalid issuance strategies : 1.3.6.1.4.1.xxxxx.1.2). Do you have any idea why i’m getting this error ? Hey Timothy, we are just wondering, are you deploying a domain joined server publiciy??? My boss is refusing to do that, I can understand his arguments, can you give me some information why you did it this way? None of the servers are public. The only public server is a VPS that runs the external public company website, which is where the CRL/AIA points to on the certificates. How easy is it to issue a web certificate to use with one of our internal IIS websites? Hmm I am getting access is denied errors when running certutil -crl and I see in the event viewer that my file://\\ entry is throwing access denied errors for base and delta crl publishing. Also in PKIView my http://pki.domain.com/pki/certificatename.crl says unable to download. This is awesome, one small question: how did you obtain BEDROCK-ECA.crl and BEDROCK-ECA+.crl? Very good series. However, the certificate names and URI can be made simpler. If you choose simple names for both CAs without spaces, it makes life so much easier. On the issuing CA you use exactly the same paths and there is no need to rename any files or suchlike. On the issuing CA the names are actually not coherent at all in the examples. Of course, I wasn’t thinking and all variables withing bracket were stripped off. They should be (with proper brackets) CaName,CertificateName.crt for AIA and CaName,CRLNamesuffix,DeltaAllowed.crl for CDP in all cases. I’m having an issue “Installing CA Certificate…” On the Enterprise CA. When I click on it, nothing happens. Both CA servers are running 2016 Core, so I’m managing them from a third server. Yes, the instructions for installing the subordinate (issuing) CA certificate does not work for a core installation managed from another server. I would say this is the best article which I found so far. Thanks for sharing. I would like to ask few questions. 1. On IIS server is it possible to remove “Default Web Site” and create a new site for this purpose then publish PKI virtual app? 2. When installing Enterprise CA, in CAPolicy.inf do we need to change the OID with random OID generated from the vba script provided on Microsoft gallery? Excellent guide! Can’t wait for the next sections. I ended up with an extra cps.html in the pki share when comparing to the final wrap-up section in Part4. Also, if it saves someone else a night.. My ‘certutil -crl’ command on the IssuingCA was failing with access denied. The IssuingCA server should be rebooted after installing ADCS so it updates it’s group membership of ‘Cert Publishers’. Very good instructions. Is there any chance to see part5, part 6, etc.? Yes, I am almost finished with Part 5… I have been for a while but I’ve been very busy lately. I could only manage to squeeze in a few quick posts here and there, but I do plan on releasing parts 5 and 6 soon. Part 5 is actually very long and involved. I hope to have it out this week.